Thursday and Friday were family filled days. Geoff's sister Jen, her husband David and her 2 kids Makenna and Delaney arrived in Grand Junction from Chicago. We had not seen them since November so that was so much fun. His younger sister Jessica (Aka Aunt Sisi) came as well. So we had days filled with playing, swimming, shopping and haning out. We also got to meet Geoff's cousins Amy and Kristin (and Kristin's husband Will). On Friday there was a HUGE Myers Family Reunion at Geoff's Aunt Cindy's house. It was the first time the entire family had been together. 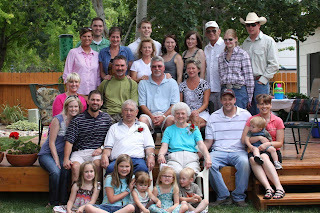 We celebrated Bucko and Babe's 60th Wedding Anniversary. Saturday we got up early and drove the 4 hours back to Denver. We enjoyed seeing the majestic mountains one more time. We had lunch with my friend Lisa (Matlack) Peck and her husband and kids. It was fun to catch up and spend some time with her sweet family. We had a horrible flight home. We flew through thunderstorms the entire time. I hate flying anyways, so it was a stressful 2 hours for me. It did not help when the lady in front of me told me, "Say your prayers, I think we're going down." Thankfully we landed safely. We had a wonderful week in Colorado and can't wait to go back again! Wednesday morning was our last in Vail. Geoff went into the village and brought back breakfast. We took the girls up into Beaver Creek (just west of Vail) to do some pony rides. Ally really enjoyed it, Molly was a little unsure. Afterwards we started our drive to Grand Junction. After stopping in Glenwood Springs for lunch, we made it Grand Junction around 2. That evening we went to visit Geoff's grandparents (Bucko and Babe) and Uncle Mark. Vail was great! Highs in the 50s and lows in the 30s. A nice break in the 100 degree temps back in Texas. We spent the day relaxing and enjoying Vail. We stayed in an awesome condo on a recommendation from a friend. We were just steps away from Vail Village and had a beautiful mountain stream off our back deck. Geoff's parents (aka Mama and Papa) stopped in for lunch as they were driving through on their way to Grand Junction. In the Betty Ford Botanical Garden right behind our condo. The gils pointing out their favorites. We spotted this in the flowers at the garden. Vail had all kinds of neat parks for the girls to play. There was even a huge pirate ship to play on. We met a nice couple at a different playground that evening and their 2 year old son Henry. The girls played with him a while. The husband was from Dallas - they had been living in Vail for 7 years. They recommended a great pizza place for dinner - which is where these silly people took this picture. End of Day 2 - more to come soon. Our recent family trip to Colorado was so much fun. I am doing this blog as a journal for my girls later on. So I am going to try to recount as much as I can so that we can remember. Monday,June 8th - We woke up around 4:30 am to drive to DFW airport for our flight to Denver. The girls were very anxious and excited to get going on our vacation. We had a decent flight into Denver and quickly got our rental Suburban (thanks for the super nice upgrade Geoff). The girls waiting to load up for our drive into the Mountains. We stopped in Idaho Springs to pan for some gems. We went to Tommy Knocker's Brewery for lunch. That's root beer guys! We continued our trek through the mountains. They would get very excited if they spotted a snow on the peaks in the distance. We drove to Vail - where we stayed through Wednesday....more to come! Say goodbye to Paci- Bye Bye! The Paci Fairy paid Miss Ally a visit last night. You see Ally is sneaking up on 3 years old (in November) and Mommy has known for quite some time that the paci needed to go. But Ally has always loved her paci and I hated to take away her comfort. Earlier this week the Tooth Fairy came to see Molly so we decided it was time for the Paci Fairy to come as well. Ally left her Paci in a little bowl on her piano. She was a good girl and only asked for it for a minute or so at bedtime. She slept thu the night without waking up and asking for it. This morning she discovered the paci fairy had indeed come and left her 5 dollar bills. She is excited to go to Target today to spend her cash. She says she wants a dress. She is her Mom's daughter---clothes come before toys!! We discovered Molly had her first loose tooth on Monday, June 1st. Seventeen days later that sucker came out. It got really loose last week on our Colorado vacation (blog coming soon--promise) while eating a hamburger. Since then it's barely been hanging on. This morning she woke up and told me she had pulled it out. Better her than me. So tooth fairy is making an appearance tonight. Look at that smile. We will also get to see Geoff's sister Jenifer and her family. They moved from Houston to Chicago this last December so we have missed them! Molly and Ally can't wait to hang out with Makenna (age 9) and Delaney (age 6). We are flying to Denver, driving to Vail. Our small family of 4 is having a mini-vacation in Vail for 2 days. Then on to Grand Junction for 3 days. Next Saturday on the way to the airport in Denver we are going to meet up with my friend from high school, Lisa (The Pecks in the right blog list). It will be fun to see her and her family even if it is only for a few hours!! Take care everyone and I'll be back in full force (yeah right) next week with lots of pictures!